Aboriginal unemployment rates are 3 times the non-Aboriginal rates. Some web-based services exclusively list Aboriginal jobs. Aboriginal employment rate in 2008 . Aboriginal employment rate in 2014 . 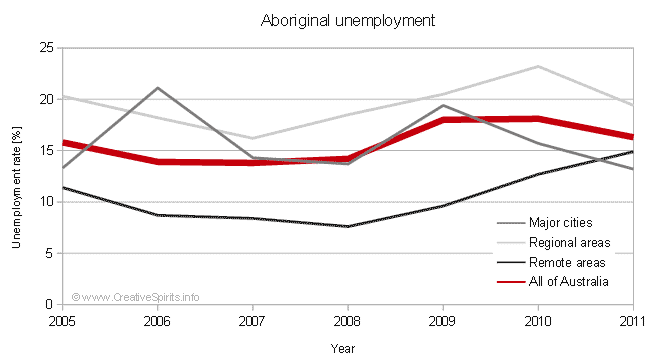 Between 2005 and 2010, the overall Aboriginal unemployment rate has remained at around 15% or above . In 2010 it was 18%. The unemployment rate was 16% in major cities, and 23% in regional areas. A high number of Aboriginal people was not participating in the labour force (44.1%), double the figure for non-Aboriginal people (23.6%) . Aboriginal people have much lower employment rates than other Australians due to factors including education, training and skill levels, poorer health, limited market opportunities, discrimination, and lower levels of job retention. Aboriginal unemployment rates across regions in Australia. Unemployment in remote areas has risen sharply to 15%, while it has dropped in regional areas and cities . Note: Employment data published by the Australian Bureau of Statistics (ABS) needs to be taken with a grain of salt because, following international guidelines, the ABS considers someone 'employed' if they are "engaged in one or more hours of work", i.e. one hour of work is enough to count as 'employed'. Some Aboriginal people lack the basics you need in order to go to work. If you hadn't an adequate house for shelter you wouldn't be able to sit down and learn. And without education you wouldn't be able to get a high-paying job. Aboriginal communities suffer from massive overcrowding in houses, creating an environment where it is hard to learn. 63% of Aboriginal Australians say that inadequate training and qualifications are a barrier to gaining employment, while 47% say they don't have a good understanding of the rules of the workplace . To get work-ready, Aboriginal workers from remote communities might need to familiarise themselves with alarm clocks and getting to work without relying on someone from the community . Some of those signing up for jobs may never have worked in an office, answered to a boss or received a salary. 52% agree that not having the right job-specific training contributed to unemployment levels, while 57% named not having someone within the workplace to help them to settle in and feel supported as a key barrier to achieve employment. The same number believed a lack of numeracy and literacy skills prevented them from getting jobs. Older Aboriginal workers can act as mentors for the young. The power of role models is important, as the young people benefit from talking to their own people who work full-time . Mentors also help young workers overcome the urge to give up and return to not having a job. Teaching life skills is just as essential as teaching work skills - how to hold on to a job, how to secure a family's future. "The areas that a mentor might cover range from talking about the person's cultural identity to dealing with life skills such as eating a good diet and maintaining hygiene," says Danny Lester, chief executive of national recruitment service Aboriginal Employment Strategy . Employers need to develop genuine relationships with Aboriginal people, communities and organisations, tackle racism in the workplace and focus on young people with proper training . Companies should also avoid creating short-term unsustainable jobs just to meet Aboriginal employment targets. Employers need to be careful not to box Aboriginal people into stereotypes. A common stereotype about Aboriginal people is that they are "lazy". People see them getting paid for doing nothing, receiving "sit-down money". While Aboriginal people are qualified, employers need to overcome their old mindset and employ them. "[Aboriginal people] were placed in casual positions cleaning a drug and rehabilitation centre 2 days a week," recounts Koori woman Kelly Briggs . "These were people who had certificate II, III & IV in business administration." While Aboriginal people like Aboriginal-specific positions, such as traineeships, to provide opportunities for entry into the job market, they need to have a clear career pathway to avoid being "locked-in" roles . Tip If you are an employer, use the above list to create your Reconciliation Action Plan (RAP). Young Aboriginal people are very keen to work but cheap overseas labourers push them out of the market. "There's no reason to say that Aboriginal people don't want to work," says Lorraine Watson, an elder involved with a Remote Area Work Scheme (RAWS) . "We get them all psyched up and ready to go and then the abattoirs will decide to pull out at the last minute because they've got overseas workers." According to Ms Watson abattoirs' applications for overseas workers are usually processed within one month while her applications for Aboriginal youth takes over 16 months. She blames the turnaround of abattoirs to money. Overseas workers' wages are subsidised whereas wages for young Aboriginal people are not . But according to a report the total cost of recruiting and bringing in each overseas worker ranged from $17,000 to $30,000 , and once their visa expires they return to their home country. A 12-month program with RAWS costs $17,000 one-off, but the skills stay in the country. Poor government policies for education and welfare have made many Aboriginal people unemployable, says Prof Helen Hughes from the Centre for Independent Studies (CIS) . The lack of education in remote areas contributes most to unemployment there, while welfare dependence does the same in capital cities. With welfare payments often higher than entry-level wages, would you go to work? A review in 2011 of Aboriginal employment programs in NSW found that 14 job programs were "basically redundant", costing around $17 million . The reviewers found that there was "not strategy or framework linking programs to the needs of Aboriginal people, and there had been little monitoring or evaluation of money spent and outcomes". NSW Aboriginal Affairs Minister Victor Dominello said that "what is needed is greater engagement with the Aboriginal community, improving and sustaining career development pathways through connected programs from school through to employment, leveraging opportunities in growth industries and regions, and strengthening relationships with the private and non-government sectors to link Aboriginal people with more employment and business opportunities" . Norforce is one of the few organisations in Australia dominated by Aboriginal people. Established in 1981, Norforce monitors Australia's northern coast for suspicious activity. Nearly 70% of the patrolmen are Aboriginal (compared to 0.97% in the Defence Force), and in 2011 Norforce welcomed their first Aboriginal officer, David Isaac , thanks to better education. Aboriginal elders and traditional owners embrace Norforce, and for those who enlist their job is a source of pride and prestige. Not only are they employed, their work involves protecting country which includes their ancestral lands. To young Aboriginal males the job helps them live and breathe their warrior role. "In Norforce we look after country and make sure ti's kept good, and no one is in there trying to destroy it," says Ronald Roe . Norforce values their Aboriginal members' bushcraft and intimate acquaintance with the land. "If something is out of place - a bush, a rock - they'll pick that up. They can see if something has been through," says Warrant Officer Bob Terms. Finding fresh water is still a vital ability too. In return for teaching such knowledge to their fellow soldiers, Aboriginal recruits learn skills that can help them find civilian jobs--medical know-how, leadership, self-confidence. Norforce respects Aboriginal ways to learn. They teach map reading outside while sitting on a hill and don't scream at recruits, which would shame them to not returning to the force. Sandra, mother of Aboriginal soldiers Michael and Eddie, is proud. "I'm really happy that my two boys are in Norforce. It's taught them a lot of things, and they look forward to it so much, even though they have to leave their families behind. They look different - fitter and healthier - and ti's been good for their character as well." For Warrant Officer Bob Terms Norforce has changed his attitudes towards Aboriginal people profoundly. "Before I joined Norforce, I wouldn't have sat in a fixhole with an Aboriginal person and shared a cup of tea... Now I don't' think twice about sharing a cup of tea with them, or giving them a smoke, and I'm honoured to be godparent to a little Aboriginal girl." Know about Aboriginal culture. Understand Aboriginal communities' grief and trauma, and the social and emotional issues that resulted from it. Show respect. Understand the affect of colonisation. Be committed to reconciliation. Ideally, have some positive experience with Aboriginal culture. Build community rapport. Try to be non-judgmental, open and honest. Accommodate customs. Accommodate custom and cultural traditions of kinship. Have men and women in the correct customary relationships. Show flexibility for culture. Allow workers to attend ceremonies by starting work early to make up for the time required in the afternoon. Commit to values. These include land, culture and ceremony, work ethic and economic drive. Improve worker's skills through formal education and training. Tailor training to prepare job-seekers for a job that exists and not simply train for training's sake. Where training is linked to a guaranteed job, some employers report a 70% retention of new Aboriginal employees to 6 months, compared to the Job Services Australia retention rate of just 24% . Know yourself as an employer. Because professional boundaries are very different in some work environments you need to know yourself and be balanced. Try innovative recruitment strategies that give Aboriginal people who would be screened out during conventional selection processes the opportunity to win jobs. Increasingly Aboriginal businesses create Aboriginal jobs. A report by the Centre for Aboriginal Economic Policy Research at the Australian National University identified the number of self-employed Aboriginal people increased substantially, rising from 4,600 in 1991 to 12,500 in 2011 . On August 31, 2009, the Australian Indigenous Chamber of Commerce launched Australia's first national Aboriginal employment website. The chamber's chairman, Warren Mundine, said that the site provided a platform for government, businesses and Aboriginal job seekers to work together to minimise Aboriginal unemployment. "Indigenous people are not as competitive as non-Indigenous people. In interviews they're not promoting themselves. They're not selling themselves. It's not to say they can't do these jobs as well as anyone else—it's just the salesmenship," he said . Most Australians (59%) would like to work with an Aboriginal person a survey found , while 66% would give an Aboriginal person employment if they had the opportunity, only 5% would not. The website is available at www.indigenousjobsaustralia.com.au. Indigenous Careers & Employment is another website for Aboriginal job opportunities. The site is 100% Aboriginal-owned and operated and launched on 19 February 2010. The company's aim is to provide "a unique, culturally aware service that connects Indigenous candidates with employers looking to attract Indigenous talent", but also non-Indigenous people with Indigenous expertise. Go to www.indigcareers.com.au for more information. Founded in 1997, the national Aboriginal Employment Strategy (AES) is a 100% Aboriginal-managed, not-for-profit recruitment company. It helps Aboriginal people get a foothold in employment by providing school-based training programs, group training, apprenticeships, recruitment services and mentorship. AES works with corporate partners including Qantas, ANZ, Commonwealth Bank, Telstra and NAB. It's work saves the government a substantial amount of money which it would otherwise spend on welfare benefits. Who owns Australia? Have the colonisers earned their right to stay and exploit the land? Or has Aboriginal ownership never ceased? Watch and listen to an Aboriginal Elder and what he found during years of research.